When we bring a new dog into our home, things do not always work out the way we want. I find that there are two common reasons this occurs; we have unreasonable expectations, or we have been misled. Alternatively, perhaps our expectations are based on the last memories we have of a dog; the one who was sixteen and slept most of the time. While it is nice to remember the best of times, it can be helpful to recall that the sleepy sixteen-year-old was a hellion at 16 months of age. For some reason many people expect a dog to live in our world with little or no training, or to master everything they need to know in just a few weeks. Patience seems to be a virtue sorely lacking in this day and age and one that every dog deserves. Sometimes it is not us that creates unreasonable expectations but others with something to gain. Publishers like book titles that sell books. A title like “Seven Days to the Perfect Dog” may sell books, but it is blatantly deceptive and plays right into people’s unrealistic expectations. Advertising that any dog can be reliable off-leash anytime and anywhere also seems to be in vogue. Those in pursuit of the dream of complete control over their dog and a life off-leash may turn a blind eye to the tools and methods that will be used because they want that perfect dog so badly. Other times they wish the best for their dog, and someone takes advantage of their naiveté. I recently had a client with a puppy that had been convinced that an underground fence system would keep her dog safely in her yard. When I explained that these “fences” worked by giving the dog an electric shock, she was aghast. Unfortunately, that piece of information had never been disclosed by the salesperson. Instead, she had been told that the dog would only feel a “vibration,” “tap,” or “stim;” nice sounding slang for “electric shock. Often those recommending shock collars insist that they cause no pain or discomfort. When they claim that a shock collar does not “hurt” the dog, they are either demonstrating their ignorance of the basic principles of operant conditioning or are intentionally being deceptive. In my opinion, an individual that does not thoroughly understand how dogs learn or are misleading about the products and methods they use and sell, should not be training dogs or offering advice on that subject. As I have noted in previous columns, experts in animal behavior such as The Pet Professional Guild (PPG) and the American Animal Hospital Association (AAHA) have explicit principles and guidelines that state that aversives such as shock, choke, and prong collars, as well as other devices designed to cause pain, MUST NEVER BE USED. They have taken this position because these devices frequently cause aggression and other behavior problems and are NEVER necessary. 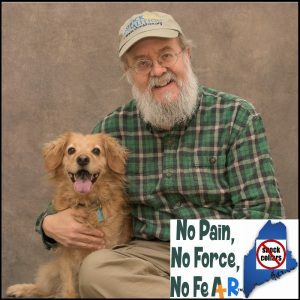 Why anyone would recommend pain to train a dog makes no logical sense. Please, be realistic in what you expect of your dog, be wary of things that sound too good to be true, ask lots of questions, and most importantly, be kind. If you need help, seek advice from a pet care professional that is committed to No Pain, No Force, and No Fear. Your dog will thank you.